"Towards Nothingness" is basically can be divided into two parts. The first 3 songs are totally the "Towards Nothingness" demo 2013 session, and the later 4 is taken from their demo 2012 "Eternally Rot" with new mix. 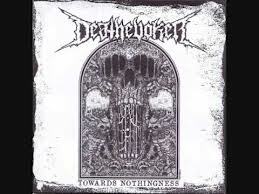 I can understand why Envenometal decided to release them in this pro CD format, DEATHEVOKER is currently one of the more honest and straight blatant old school death Metal worship from the local scene. One tone of the guitars rumble, you already know they're nodding towards the filthy sides of Sweden. That crunching, menacing unmistakable tone. These 7 songs here are all that, the only way to divide them might be the more enveloped, fuller sound of the newer tracks of "Towards Nothingness", as "Eternally Rot" already confirming the band's damned destiny. I could use a little more shapes and moulds in DEATHEVOKER materials though, the vocals could be a bit more imaginative, the drums could be a little more tighter, blablabla; perhaps a bit too straightforward and going by the ruler rigidly at times, but "Towards Nothingness" is good enough if you need some rotting death Metal with less of a headache to tinker with the instrumentations. Just let it ro(t)ll. Ahh, with a fitting artworks nevertheless.